Added a Raider Bot to commemorate a sadly departed member of the community. Developer comment: After reading FatMooch69’s remembrance of his fallen comrade (https://www.reddit.com/r/forhonor/comments/7yivnm/one_year_ago_today/) our dev team quickly got behind the idea of immortalizing ‘B’ in the game as a bot. After reaching out for more specifics on the real ‘B’, we named the Bot ‘TheeLizardWizard’ in honor of B’s preferred nickname, and made him a Raider, as he was B’s main. So if you see “TheeLizardWizard” charging at you in the heat of battle, pay him tribute by giving him a good fight! [Adjustment] Revenge Shield is increased to 120 HP (from 70). Developer comment: The intention with this increase is to let people survive better when in Revenge. We think that at 120 HP, it should reduce the efficiency of the "death ball behaviour". We found that top players already had a high survivability when the Revenge Shield was at 70, so we think that at 120 it should have only a minor effect on high-level play, while making Revenge a much more helpful tool in all skill levels. [Adjustment] Increased the time it takes to Revive a players to 4 seconds (from 3) for all PvP game modes, excluding time-limited events. Developer comment:Currently, we feel it can be too difficult to prevent an opponent from reviving an ally. With this increase, all characters should now have an easier time to do so. [Adjustment] Normalized all side dodges recoveries to 600ms. Developer comment:We’re recently normalized timing and movement for backward dodge. We’re also now standardizing side dodges, allowing us to better predict what moves you can punish on dodge. [Adjustment] Removed side dodge’s ability to move backward at the same time as sideways. Developer comment:By removing the backward movement, we remove the case where diagonal side-back dodge would escape even more situations than side dodge or back dodge. [Adjustment] On a successful Drop Attack you will no longer lose any Health. Before you would lose a percentage of your Health even if the Drop Attack was successful. 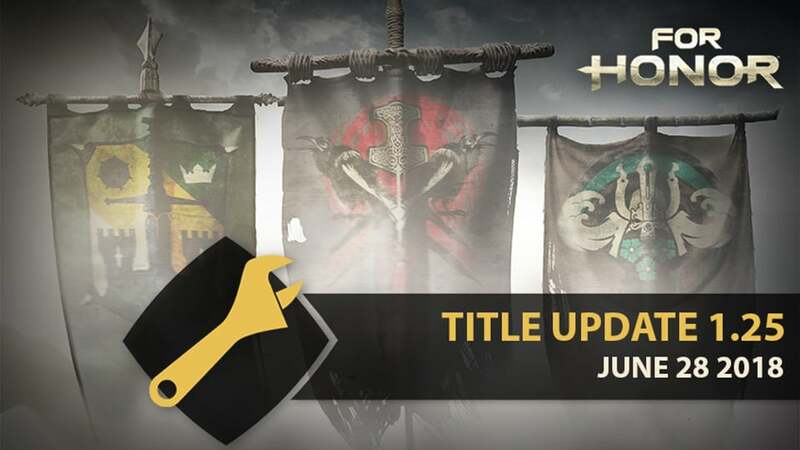 [Bug Fix] Fixed an issue that caused the current parameters status displayed during matchmaking to be updated earlier than they actually were in the back end. Developer Comment:Due to popular demand, the default text chat scope is now set to Team to allow more communication between team members in a match. We will monitor the Text chat usage and make changes based on players’ behavior. Added an optional Mature Language filter to the Text chat. Enabled by default, the filter can be disabled in the User Interface options. [Bug fix] Fixed an issue where heroes could spam attacks after unlocking to go into out of lock, but they kept using their locked attacks. Now it properly uses the Out of Lock attacks. [Bug Fix] Fixed an issue that allowed the Conqueror to use Flail Uppercut after blocking any minion's attack. [Bug Fix] Fixed an issue that caused the "You Like This?" emote to sometimes glitch during matches. [Bug Fix] Fixed an issue that caused The "Spear Twirl" emote to sometimes glitch during matches. [Improvement] “Zephyr Strike” and “Storm Rush” now makes the Stance Change on Recovery happen 200ms later. Instead, during that 200ms timing, we allow Orochi to branch in the 2nd attack. Developer Comment:This allows Orochi to slightly delay his attacks after “Storm Rush” and “Zephyr Strike” to make them less predictable. [Bug Fix] Fixed an issue that caused the “Storm Rush” stamina cost to be applied before the indicator appeared. [Bug Fix] Fixed an issue that cause the “Storm Rush” camera to glitch during the miss animation. [Bug Fix] Fixed an issue that allowed the Nobushi to be able to unlock during the start-up and recovery frames of some moves and perform special moves such as “Hidden Stance”, “Hidden Stance” attacks, “Cobra Strike”, “Viper's Retreat” and “Kick”. [Bug Fix] Fixed an issue that caused the Centurion animation to switch from top to right when opponent is activating revenge during “Imperial Might”. [Bug Fix] Fixed an issue that caused the Centurion’s animation to glitch while switching target after knocking down 2 opponents with revenge activation and changing target. [Bug Fix] Fixed an issue that caused the Gladiator’s “Sucker Punch” to not connect after throwing your opponent into a wall. 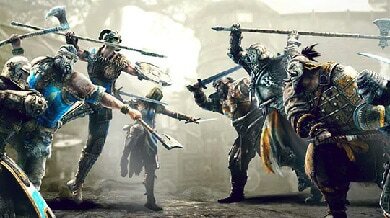 Developer Comment:This change gives some consistencies between the characters (example: the Shugoki can connect his Demon KO after throwing his opponent against a wall). [Bug Fix] Fixed an issue that caused the Gladiator’s “Skewer” to be interrupted by an incoming Guard Break. [Bug Fix] Fixed an issue that caused the Shaman’s “Wild Cat’s Rage”, “Predator’s Hunger” and “Predator’s Mercy” to apply the stamina cost of attacks before the indicator appears. [Bug Fix] Fixed an issue that caused the Shaman to be unable to react to Peacekeeper Zone Attack after a blocked “Raven’s Claw”. [Bug Fix] Fixed an issue that caused the “Punch Through” feat to become disabled after dying. Developer Comment:The uninterruptible property of the feat was being disabled when dying. It is now kept through death and for the whole duration of the match. [Bug Fix] Fixed an issue that caused the “Long Bow” and “Javelin Storm” to be unusable when performed in alternate stance. Developer Comment:It was never the intention to prevent players from performing those feats. The issue is now fixed. [Bug Fix] Fixed an issue that caused the Berserker’s forward throw to no longer deal bleed damage while the feat “Sharpen Blade” is active. [Bug Fix] Fixed an issue that allowed the Warlord’s “Shield Charge” to affect an opponent that has the “Steadfast” feat active. [Bug Fix] Fixed an issue that caused the Bots not to dodge the Highlander's "Balor's Might" move while performing it from the left stance. [Bug Fix] Fixed an issue that caused the stamina cost of throws to be shown twice in Arena. Now the full cost will only be shown once instead of splitting it into 2 entries. [Bug Fix] Fixed an issue that caused the Kensei’s Zone Attack to use the wrong animation in Story Mode. [Bug Fix] Fixed an issue that caused the game to crash when Alt-Tabbing or going to the Home screen of the console while viewing Legacy Bundles in the Store. [Bug Fix] Fixed issue that caused the Quit button to be missing on the end screen of some Apprentice Trials after quitting without completing them. [Bug Fix] Added a missing Paint Pattern, “Symmetry Cells”, to the Battle Outfit “Steered Automata” for the male Raider. 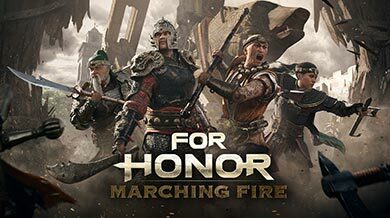 [Bug Fix] Fixed an issue that prevented Bots to be aware of incoming feats like “Arrow Strike”, “Fire Flask”, “Fiat Lux”, “Igneus Imber”, “Pugno Mortis” and “Spear Storm”. Developer Comment: A bug was preventing bots from being aware of those incoming feats, or from reacting to their actual radius, making them easy targets.